After so much frantic writing recently for uni and work, I’ve decided that I obviously don’t do enough *facepalm* so I’ve signed up for NaBloPoMo 2017. 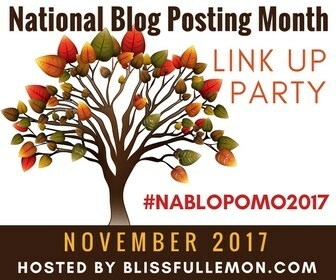 For those of you who are new to the concept, NaBloPoMo (National Blog Posting Month) is a US organised event that encourages us to post every day for the month of November. Living in the southern hemisphere, November is one of the busiest months of the year for me, especially from a gardening point of view, so it might seem a little ambitious to do this challenge but I’ve managed to complete it successfully every year I’ve been involved. I think this is my fourth time and while it looks daunting (and every year immediately makes me feel tired), I always get so much out of it, and trust me, it’s a thoroughly enjoyable experience. For instance, it’s helped me focus my blog writing and be disciplined about what I do. Some of you might dispute that – I haven’t posted anything for weeks and feel quite bad about that – but life really does get in the way sometimes! Perhaps the most rewarding thing about doing this challenge is how it puts me in contact with other bloggers and the sense of global community that follows. I think this aspect alone is a great reason to try the challenge. In the meantime, I’m planning to write about my urban farm as it’s spring here in Tasmania, the hens have produced yet another egg glut and everything is booming – especially the weeds! I’ll also be including some posts about what I’m currently doing at university, the music and food gardening programs I’m teaching, the food I’ve been cooking and mix in a movie/book/music review or two, which helps with my degree course. So hold on, the ride’s about to start! Hi! found you from the linkup and I also love meeting new blog friends. You had the most interesting title so I clicked here first. Looking forward to many more. Hi Kate, pleased to meet you! I love NaBloPoMo for all the interesting folks I meet. I look forward to reading your posts! Fresh eggs sound delicious, now I know what I will eat for breakfast tomorrow! Happy writing, and see you on the NaBlo! As someone with an urban community garden plot (albeit one heading into the slow months of the year now), I’ll be following your farming posts with interest. So excited to join in and meeting new people. Your crazy life sounds fun and I can not wait to read more. What a great idea. I used to post daily blogs but found it quite challenging after a while and now it’s only as and when I can.